These greens are a little salty, a little sweet, and a lot healthy. In a large skillet over medium-high heat, working in small batches so as not to crowd the pan, cook bacon until done. Remove bacon from pan. Roughly chop. 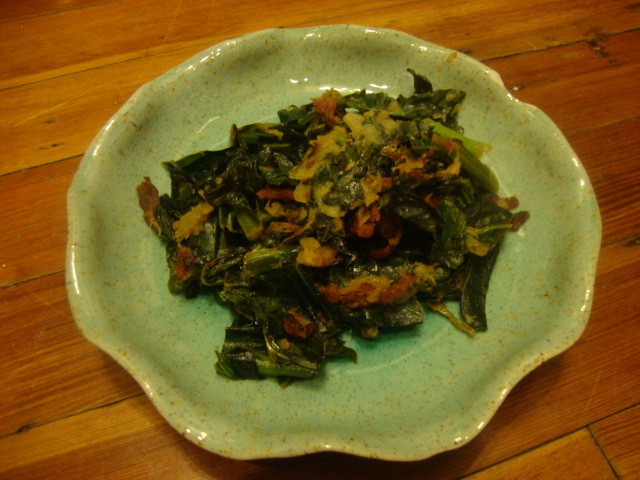 Place collard greens and chicken stock in skillet with bacon grease. Steam-sautee until softened and all liquid is gone. Add pineapple to collards and cook another 5 minutes, stirring regularly. Return chopped bacon to skillet and toss to combine. Note – If using a low-sodium chicken stock you may wish to add a pinch of salt to the greens as they cook.